Nabco Radio Reports - North American Broadcasting Company Inc.
North American Broadcasting wants you to be informed about your media buying decisions. We have provided a extensive list of articles pertaining to radio for you to read about our industry. Please feel free to contact us at any time with any questions you may have about radio or our stations. Radio revenues from the automotive category may have softened in the first quarter of 2013 but the medium continues to be the top performer for the amount of time planned vehicle purchasers spend with any media. Planned vehicle purchasers spend more than 20% of their day with radio compared to second ranked internet (no email) at 18%. 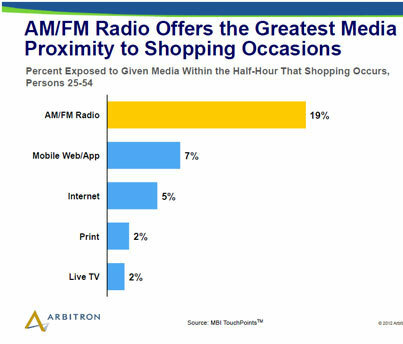 AM/FM Radio is the media used most often during shopping. Persons 25-54 listen to radio more than using any other type of media while they shop. 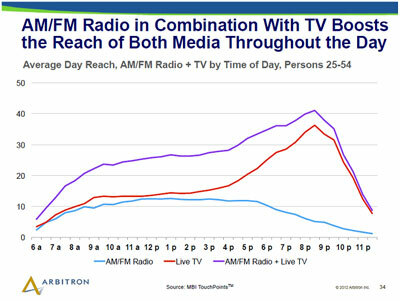 AM/FM Radio gets the most exposure while consumers are out buying. 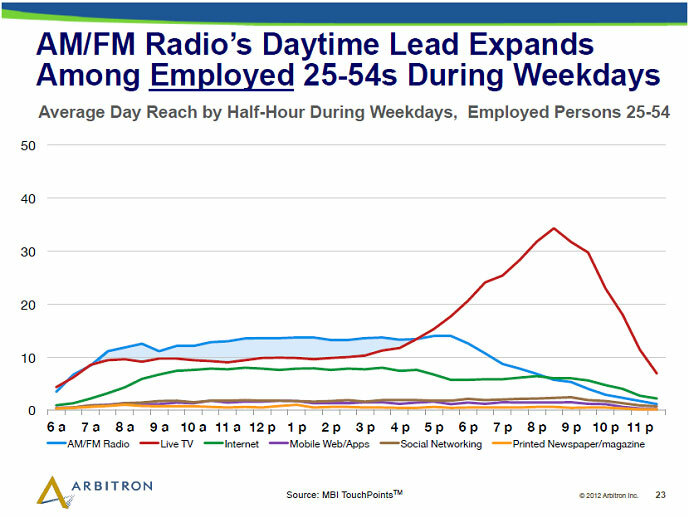 These figures represent “Weekly Cume Ratings.” For example, slightly less than 93% of Women 18-24 in the United States tuned in to radio at least once during an average week, between the hours of 6AM and Midnight, Monday through Sunday. The tan background represents the average of all Americans at least 12 years old who listen to radio at least once during the week (92.5%). 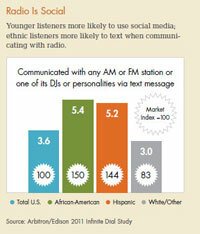 You can then see how radio reaches various demographic groups compared to the national average. 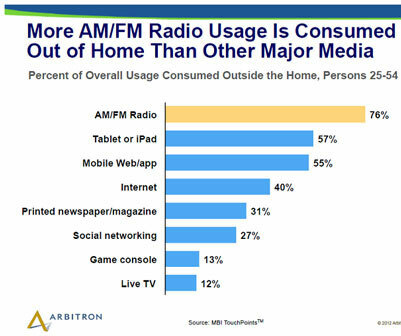 AM/FM Radio is the leader in out of home media consumption. 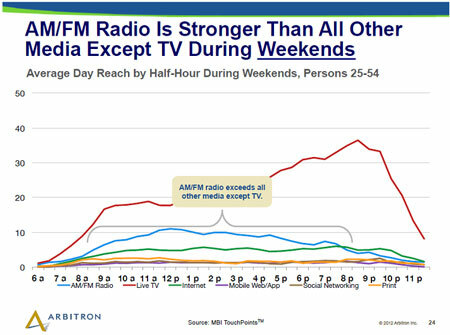 Persons 25-54 listen to AM/FM Radio more than any other media outlet when spending time outside of home. 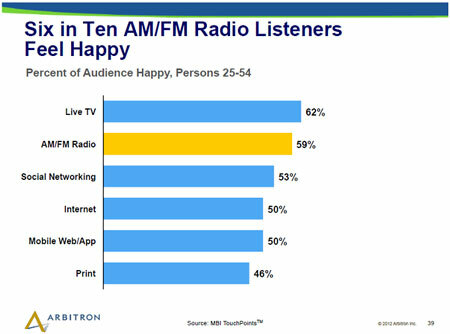 Radio gets the most consumption when consumers are on the go. 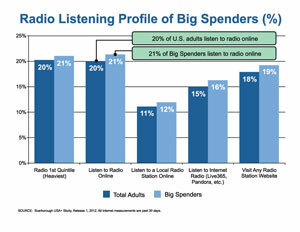 Radio Strong: Arbitron December 2012 RADAR 115 National Radio Listening Report. 92% of the U.S. population on an average weekly basis. 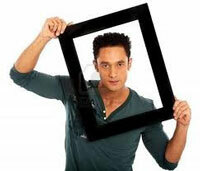 Adults 18 to 34 shows the largest gains among the major age demographics, adding more than 600,000 weekly listeners. 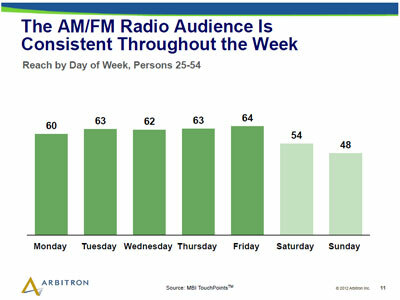 Radio reached 67 million adults aged 18-34 in an average week. Radio reaches nearly 126 million adults aged 18 to 49 and more than 119 million adults aged 25 to 54 in an average week. 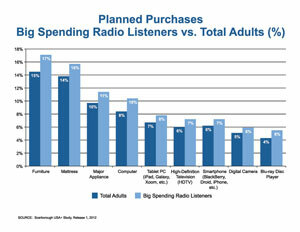 The December 2012 RADAR report illustrates radio’s ability to attract affluent, educated consumers. More than 95% of adults aged 25 to 54 with a household income of $75K or more and a college degree tune in to radio on a weekly basis, that’s nearly 26 million listeners in this demographic. Also, nearly 70 million, or 94%, of Adults aged 18 to 49 with a household income of $75K or more tune into radio on a weekly basis. 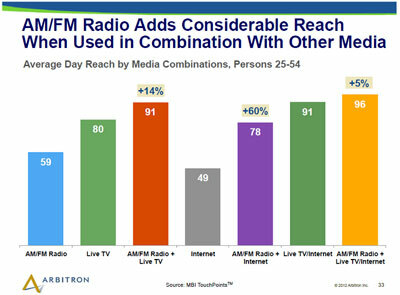 Radio continues to dominate the audio entertainment landscape, and out delivers web, social networking or mobile usage during the average day among Adults age 25 to 54. 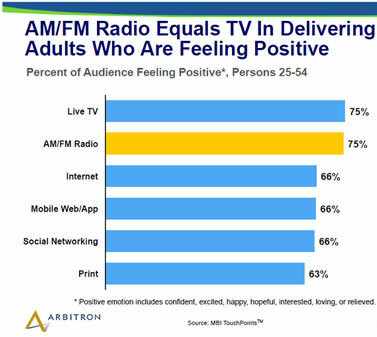 These are the most notable findings of a study commissioned by Arbitron and presented at this week's Radio Show, hosted by the National Association of Broadcasters and the Radio Advertising Bureau in Dallas. AM/FM radio is the strongest pre-shopping medium, reaching 31% of 25-54s during the hour before the peak shopping period (1-2PM). 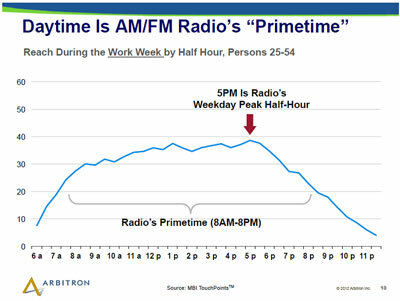 AM/FM Radio's reach during this crucial decision making hour is nearly twice that of live TV (17 percent). 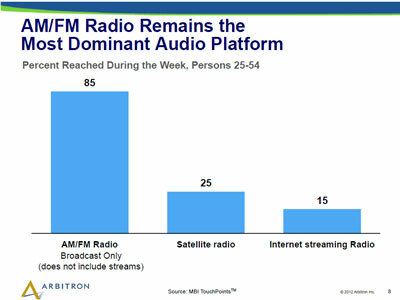 AM/FM radio delivers 86 percent of the total time Adults aged 25 to 54 spend with the three main audio platforms. 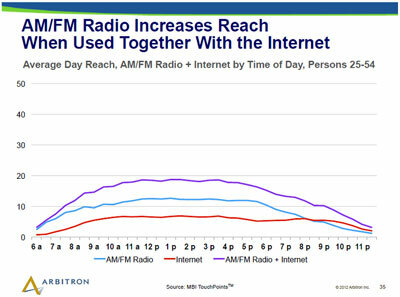 AM/FM Radio delivers nearly eight times more time spent than satellite radio and seventeen times more than internet audio streaming. 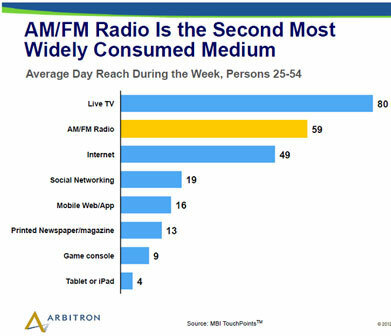 AM/FM radio is the second most widely consumed of the top media platforms. During the average day, radio reaches 59 percent of adults aged 25 to 54, second only to television, which reaches nearly 80 percent of these adults. Trailing radio are the Internet (49 percent), social networking (19 percent), mobile web/app usage (16 percent). 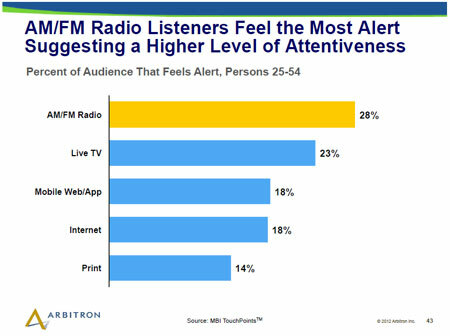 AM/FM radio is heard by a variety of decision influencers with 43 percent of respondents aged 25 to 54 saying they listen with their children, 38 percent listen with their spouse or partner. The downturn of the American economy had a strong impact on the 20 percent of American adults who are Millennials, many of whom graduated from school into the declining job market. 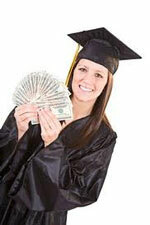 A much-discussed issue among Millennials during the financial crisis has been student loan debt. Millennials are 26 percent more likely than other generations to live in a home that has taken a personal loan in the past year. Their attitudes back up this behavior as they are also 29 percent more likely to disagree that they hate to borrow money and 10 percent more likely to agree they feel overwhelmed by financial burden. 65 percent of Millennials live in a household that has no investments. They are, however, leading the way in terms of digital financial management. Millennials are 21 percent more likely to agree they would be happy to use the internet to carry out day to day banking transactions. 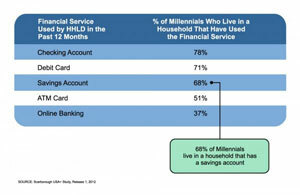 In fact, they are 15 percent more likely to live in a house that has used online banking in the past 12 months. Though Millennials may not be investors, and may be open to taking loans, they still have an understanding of their personal finances. Millennials are 32 percent more likely to agree that they always know broadly how much is in their bank account at any one time. While they are also 22 percent more likely to disagree that their parents tend to be savers rather than spenders. Radio is fully digital with Facebook pages, smartphone apps, Twitter feeds, streams, and websites that extend the value of its brand—advertising wherever consumers engage with content. For example, when Novamex expanded their marketing efforts beyond Hispanic media into the general market with a multi-tier campaign that included online, social media, and out-of-home components, the company used radio as the glue to hold everything together. “Radio is the capstone of this project; we need it to drive people to the various platforms to engage with the brand,” said Flynn. It turned out to be a good strategy considering the results of a Harris Interactive study shows that unaided brand recall for an advertiser is nearly 4.5 times greater when radio is used to supplement an Internet-based ad campaign. 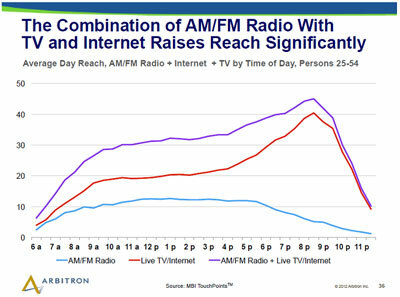 According to the Arbitron/Edison 2011 Infinite Dial Study, one of the most difficult audiences to connect with—young adults aged 25 to 35—are 24% more likely than other demos to have communicated with a radio station via Facebook or Twitter. In the last five years, online radio listening has grown to include more than 89 million people each week, according to the Infinite Dial study. 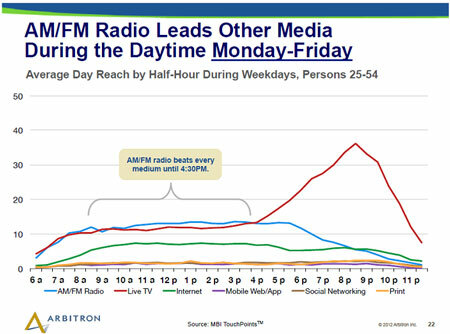 The growing audience consuming audio online has not left broadcast radio. 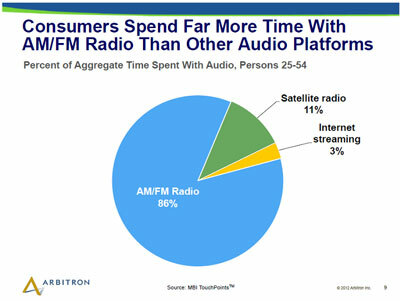 Over-the-air stations still receive an average of 109 minutes of listening per user each day. In fact, nearly nine out of every ten people who listen to audio streams in a week also tune to terrestrial radio. That has led companies to embrace streaming with platforms, which are making stations from across the country available to millions of new listeners through their computers, tablets, and mobile phones. A new analysis from Scarborough profiles the shopping habits of America’s Big Spenders who are avid radio listeners – those adults who typically say they are a “spender rather than a saver” and who are among the country’s top radio listeners*. Not only do Big Spending radio listeners already spend, but they also plan major household purchases during the next year. They are slightly more likely than total adults to plan to purchase popular stocking stuffers like iPads, HDTVs and smartphones. 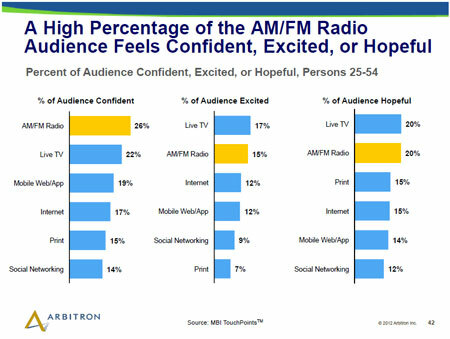 Despite the rapid growth of Pandora, a recent online survey of 1,017 adult Americans conducted by Vision Critical indicates that Pandora’s gains are not coming at the expense of AM/FM radio. 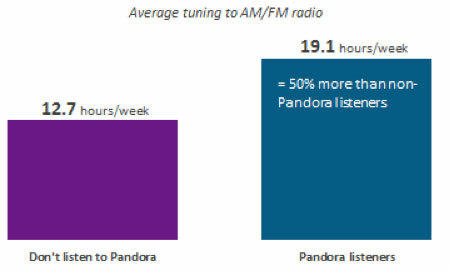 In fact, the results of this study showed that Pandora listeners report spending 50% more time listening to AM/FM radio than non-Pandora listeners. “Pandora users are musical omnivores who want all the music that they can get, however they can get it. They not only listen to more broadcast radio, they listen to more music on their iPod, on CDs and satellite radio,” says Jeff Vidler, Senior Vice President of Media and Entertainment Research at Vision Critical. “It’s additive. Rather than displacing other ways of listening to music, Pandora is just another way for music fans to indulge their passion for music.